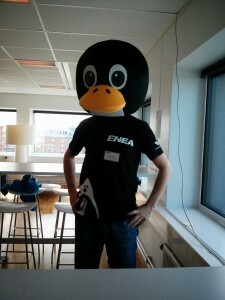 Once again our gracious sponsor Enea hosted an embedded hacking day arranged through foss-sthlm – the third time in three years at the same place with the same host. Fifty something happy hackers brought their boards, devices, screens, laptops and way too many cables to the place on a Saturday to spend it in the name of embedded systems. With no admission fee at all. Just bring your stuff, your skills and enjoy the day. This happened on May 24th and on the outside of the windows we could identify one of the warmest and nicest spring/summer days so far this year in Stockholm. But hey, if you want to get some fun hacks done we mustn’t let those real-world things hamper us! We also collected random fun hardware pieces donated to us by various people for a hardware raffle. More about that further down. Bluetooth and Low Power radio byÂ Mats Karlsson and during this session we got to learn a bunch about hacking extremely low power devices and doing radio for them with Arduinos and more. We hadn’t much more than started but the clock showed lunch time and we were served lunch! 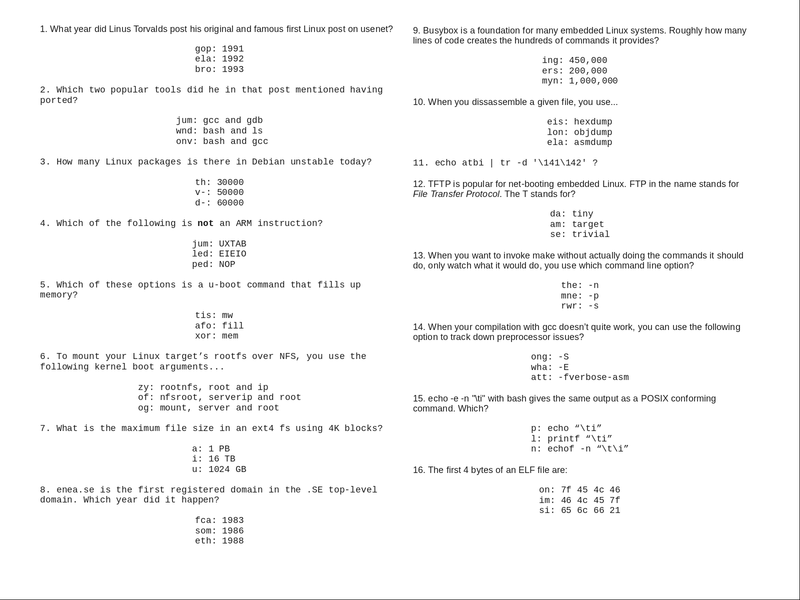 Readers of my blog and previous attendees of any of the embedded hacking days I’ve been organizing should be familiar with the embedded Linux contests I’ve made. 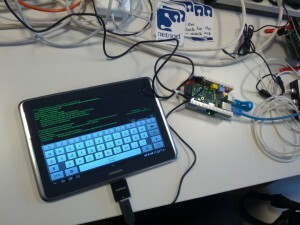 Lately I’ve added a new twist to my setup and I tested it previously when I visited foss-gbg and ran a contest there. Basically it is a complicated maze/track that you walk through by answering questions, and when you reach the goal you have collected a set of words along the way. Those words should then be rearranged to form a question and that final question should be answered as fast as possible. 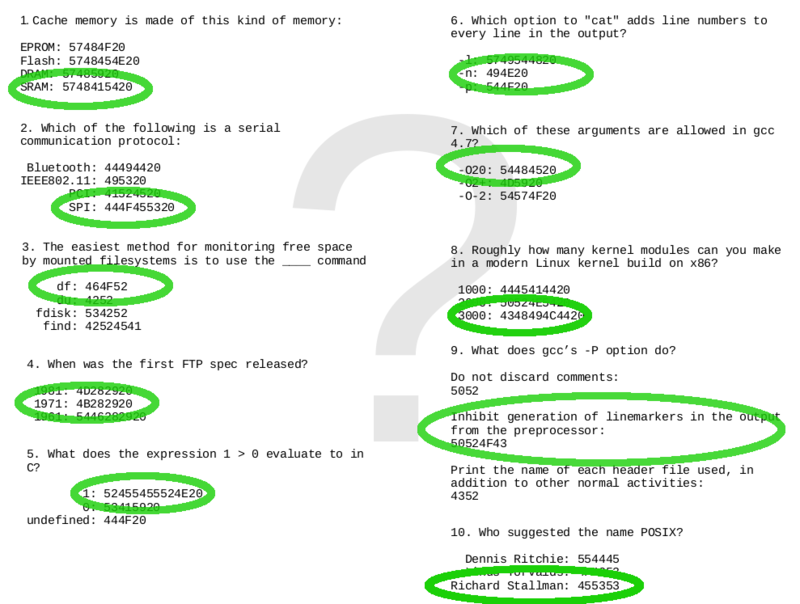 Since I already blogged and publicized my previous “Parallell Spaghetti Decode” contest I of course had a new map this time and I altered the set questions a bit as well, even if participants in the latter can find similarities in the previous one. 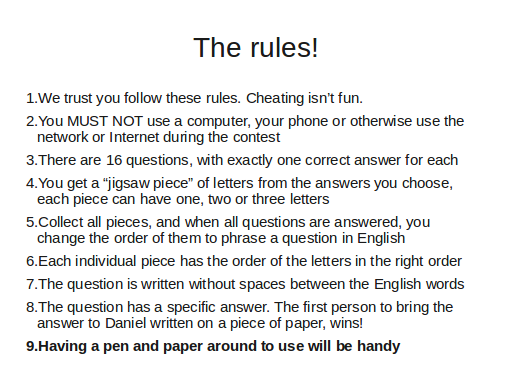 This kind of contest is a bit complicated so for this I hand out the play field and the questions on two pieces of paper to each participant. 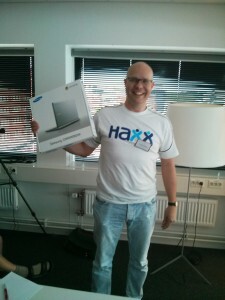 After only a little over seven minutes we had a winner, Yann Vernier, who could walk home with a brand new Nexus 7 32GB. The prize was, as so much else this day, donated by Enea. Everyone who was interested in one of the 5 devices signed up on a list, marking each thing of interest. We then put little pieces of paper with numbers on them in a big bowl and I got to draw 5 numbers (representing different individuals) who then won the devices. It of course turned out we did it in a complicated way that I had did some minor mistakes in to add to the fun. In the end I believe it was at least a fair process that didn’t give any favors or weight in any particular way. I believe we got 5 happy winners. 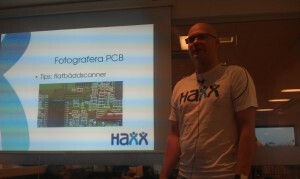 “How to select hardware” was the name of the workshop I lead. Basically it was a one hour group discussion around how to buy, find, order, deal with, not do, avoid when looking for hardware for your (hobby) project. Discussions around brands, companies, sites, buying from China or Ebay, reading reviews, writing reviews, how people do when they buy things when building stuff of their own. 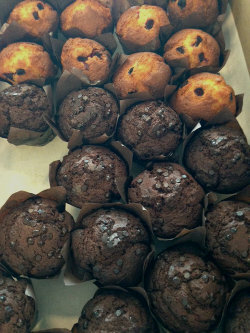 After that we refilled our coffee mugs and indulged in the huge and tasty muffins that magically had appeared. Something we had learned from previous events was to not “pack” too many talks and other things during the day but to also allow everyone to really spend time on getting things done and to just stroll around and talk with others. Instead of a third slot for a talk or another workshop we had a little wishlist in our wiki for the day, and as a result I managed to bully BjÃ¶rn Stenberg to the room where he then described his automated system for his warming cupboard (vÃ¤rmeskÃ¥p) which basically is a place to dry clothes. 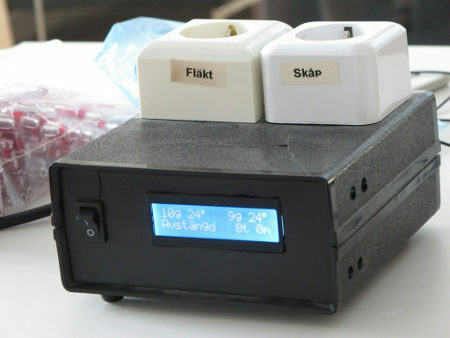 BjÃ¶rn has perfected his cupboard’s ability to dry clothes and also shut off/tell him when they are dry and not waste energy by keep on warming using damp sensors, Arduinos and more. With that we were in the final sprint for the day. The last commits were made. The final bragging comments described blinking leds. Cables were detached. Bags were filled will electronics. People started to drop off. Only a few brave souls stayed to the very end. And they celebrated in style. I had a great day, and I received several positive comments and feedback from participants. I hope we’ll run a similar event again soon, it’d be great to keep this an annual tradition. 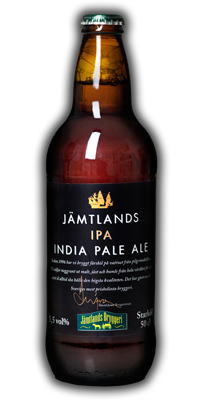 The pictures in this blog post are taken by: me, Jon Aldama, Annica Spangholt, Magnus Sandberg and JÃ¤mtlands bryggerier. Thanks! 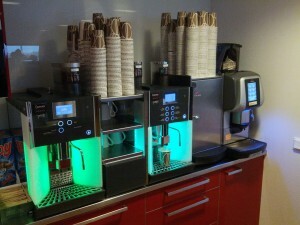 More pictures can also be found in Enea’s blog posting and in the Google+ event. Thanks also to Jon, Annica and Sofie for the hard hosting work during the event. It made everything run smooth and without any bumps! We started off this second embedded hacking day (the first one being the one we had in October) when I sent out the invitation email on April 22nd asking people to sign up. 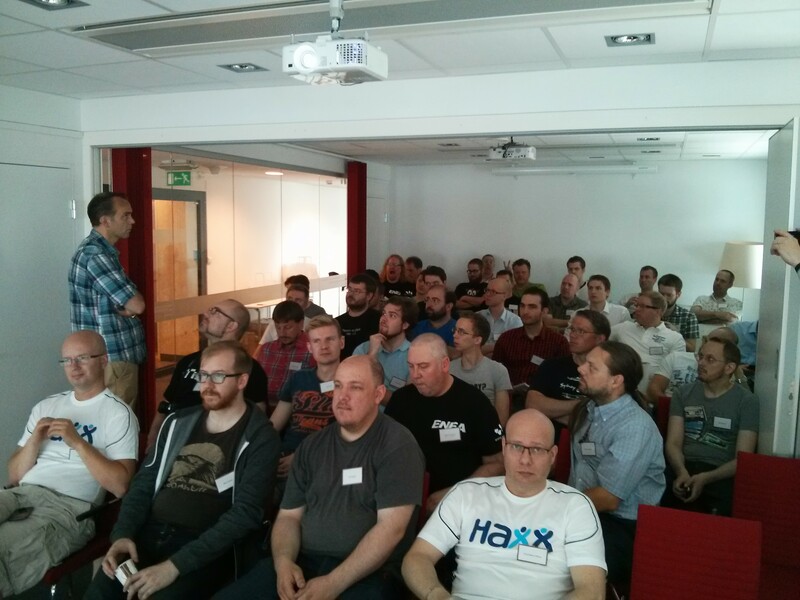 We limited the number of participants to 40, and within two hours all seats had been taken! Later on I handed out more tickets so we ended up with 49 people on the list and interestingly enough only 13 of these were signed up for the previous event as well so there were quite a lot of newcomers. At 10 in the morning on Saturday June 1st, the first people had already arrived and more visitors were dropping in one by one. They would get a goodie-bag from our gracious host with t-shirt (it is the black one you can see me wearing on the penguin picture on the left), some information and a giveaway thing. This time we unfortunately did not have a single female among the attendees, but the all-male crowd would spread out in the room and find seating, power and switches to use. 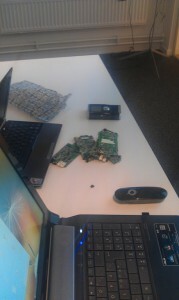 People brought their laptops and we soon could see a very wide range of different devices, development boards and early design ideas showing up on the tables. Blinking leds and cables everywhere. Exactly the way we like it! We decided pretty early on the planning for this event that we wouldn’t give away a Raspberry Pi again like we did last time. Not that it was a bad thing to give away, it was actually just a perfect gift, but simply because we had already done that and wanted to do something else and we reasoned that by now a lot of this audience already have a Raspberry pi or similar device. So, we then came up with a little device that could improve your Raspberry Pi or similar board: a USB wifi thing with Linux drivers so that you easily can add wifi capabilities to your toy projects! And in order to provide something that you can actually hack on during the event, we decided to give away an Arduino Nano version. Unfortunately, the delivery gods were not with us or perhaps we had forgot to sacrifice the correct animal or something, so this second piece didn’t arrive in time. Instead we gathered people’s postal addresseAns and once the package arrives in a couple of days we will send it out to all attendees. Sort of a little bonus present afterwards. Not the ideal situation, but hey, we did our best and I think this is at least a decent work-around. 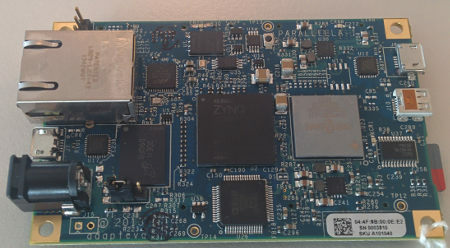 In the big conference room next to the large common room, I said welcome to everyone at 11:00 before I handed over to Magnus from Xilinx to talk about Xilinx Zynq and combining ARM and FPGAs. 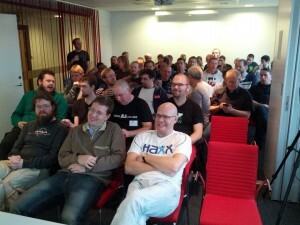 The crowd proved itself from the first minute and Magnus got a flood of questions immediately. Possibly it was also due to the lovely combo that Magnus is primarily a HW-guy while the audience perhaps was mostly SW-persons but with an interest in lowlevel stuff and HW and how to optimize embedded systems etc. 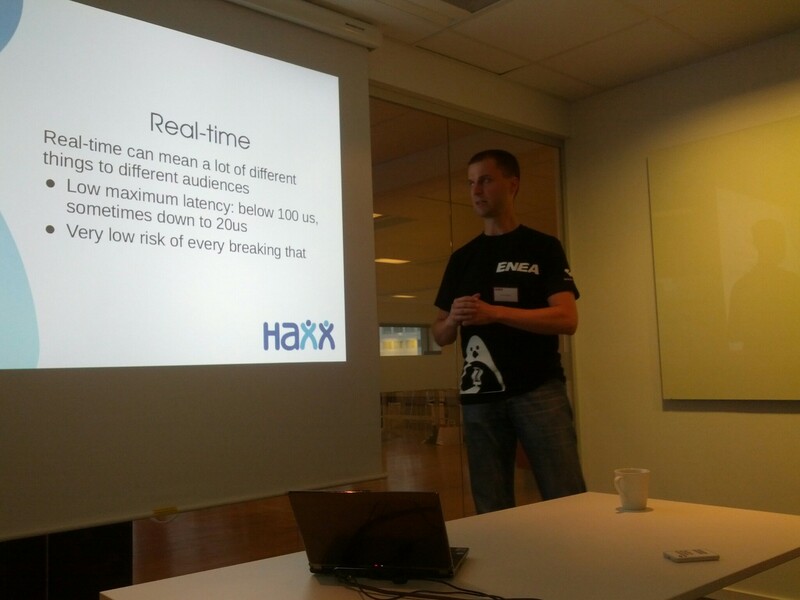 After this initial talk, lunch was served. I got lots of positive feedback the last time on the contest I made then, so I made one this time around as well and it was fun again. See my separate post on the contest details. 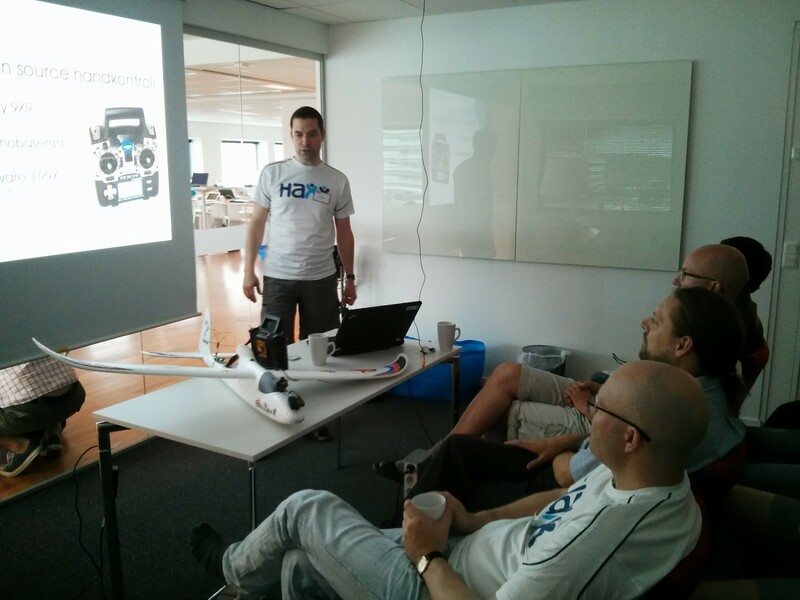 After the dust had settled and everyones’ pulses had started to go back to normal again after the contest, BjÃ¶rn Stenberg “took the stage” at 14:00 and educated us all in how you can use 7 Arduinos when flying an R/C plane. 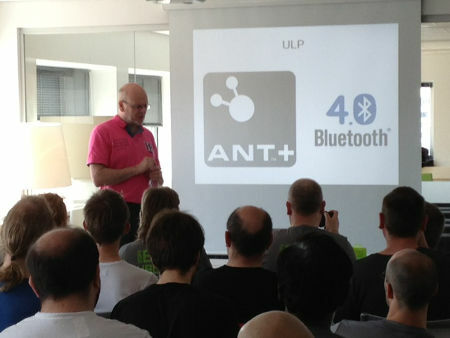 It seemed as if BjÃ¶rn’s talk really hit home among many people in the audience and there was much talking and extra interest in BjÃ¶rn’s large pile of electronics and “stuff” that he had brought with him to show off. 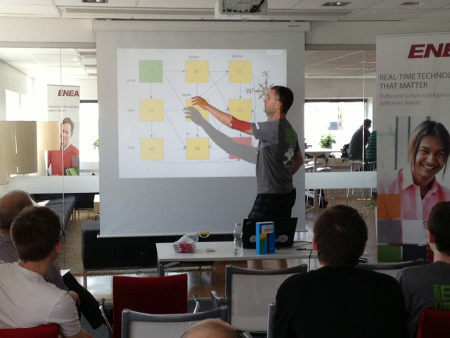 The final video BjÃ¶rn showed during his talk can be found here. People actually want to get something done too during a day like this so we can’t make it all filled up with talks. 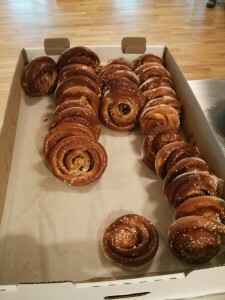 Enea provided candy, drinks and buns. And of course coffee and water during the entire day. Erik helped put the light on some sides of the C programming language that perhaps aren’t the most used or understood. How aliasing can be used and what pitfalls it can send us down into! 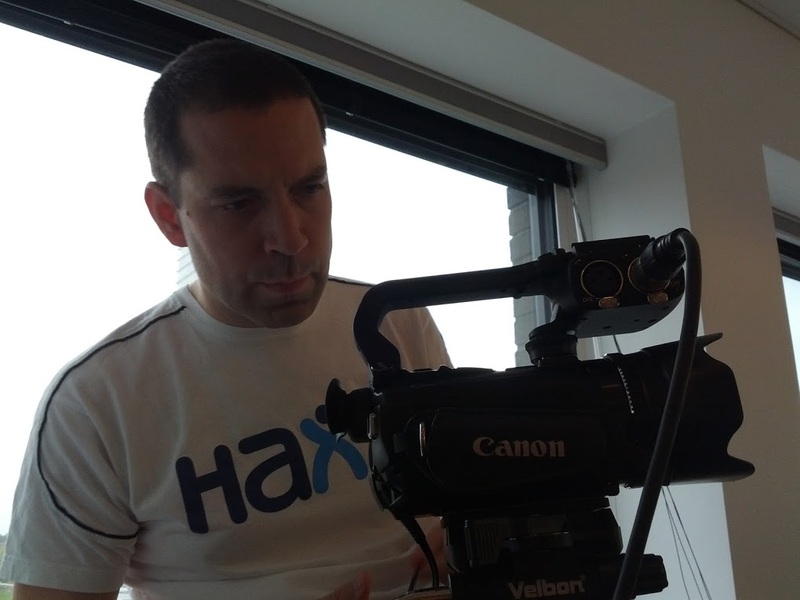 We made sure to videofilm all the talks so we should hopefully be able to provide online versions of them later on. I took the last speaker slot for the day. I think lots of brains were soft by then, and a few people had already started to drop off. I talked for a while generically about how the real-time problem (or perhaps low-latency) is being handled with Linux these days and explained a bit about PREEMPT_RT and full dynamic ticks and what the differences of the methods are. The answer to the question is 0 (zero). Short and simple. See fork’s man page. 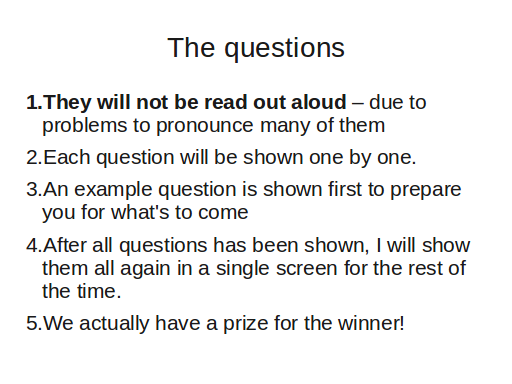 After 13 minutes and 20 seconds since I clicked start on the timer, Linus Nielsen Feltzing approached me with a little note with the correct answer and we had a winner! The very happy Linus was very disappointed in the previous competition when he was very close to winning but was beaten just within seconds by last time’s winner. 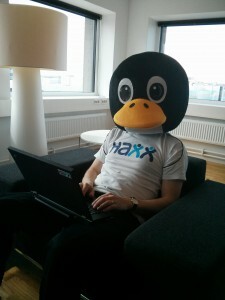 During our embedded Linux hacking event in Stockholm on October 20th I ran a little contest for the ones who wanted to participate. I created it entirely by myself to allow as many people as possibly to participate with them knowing me or me knowing them etc limiting the fun. For your amusement I include the full contest here. If you want to try it out, then make sure you don’t attempt to google for any answers or otherwise use a machine/computer as a help. 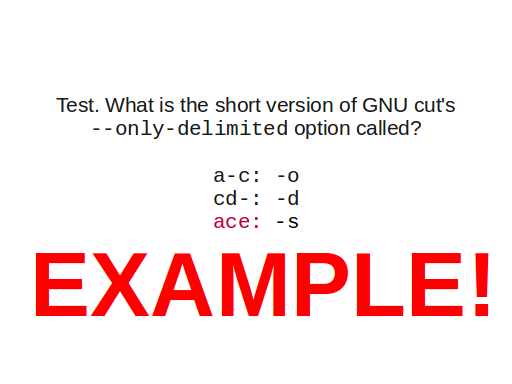 Here I just want to mention that, as is shown in the above example question, ‘ace‘ is the correct character sequence and the letters should then be kept in that order in the final question. Also note that a character sequence can legally contain a dash as well. You will get 16 similar sequences of 1 to 3 letters, and those 16 sequences should be moved around to form the 17th question. My take away from this contest is that it was harder than I anticipated and took a longer time to crack than I thought. I gave away a few additional clues and hints as the time went by, but in the end I believe there were several persons who were very close to breaking it at almost the same time. 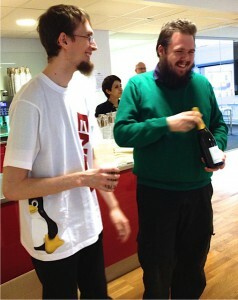 In the end, Klas and Jonas presented the correct answer first and won the bottle of Champagne. I’m sure you appreciate their efforts after having tried this yourself! I had a great time creating the competition and I believe the competitors appreciated it. Additional trivia: I created the letter sequences for the other alternatives by writing otherÂ EnglishÂ phrases and chopped them up, so that they were from actual English and hence possibly more believable. On September 10th, I sent out the invite to the foss-sthlm community for an embedded hacking event just before lunch.Â In just four hours, the 40 available tickets had been claimed and the waiting list started to get filled up as well… I later increased the amount to 46, we had some cancellations and I handed out more tickets and we had 46 people signed up at the day of the event (I believe 3 of these didn’t show up). At the day the event started, we still had another 20 people in the waiting list with hopes of getting a spot! In Enea we had found an excellent sponsor for this event. They provided the place, the food, the raspberry pis, the coffe, the tshirts, the infrastructure and everything else that had to be there to make it an awesome day. 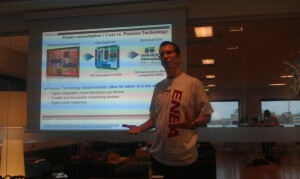 We started off the event at 10:00 on October 20 in the Enea offices in Kista, Stockholm Sweden. 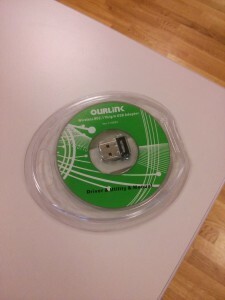 People dropped in one by one and were handed their welcome presentÂ containingÂ a raspberry pi board, a 2GB SD card and a USB-to-serial cable to interface/power the board with. People then found their seats in the room. There were fruit, candy, water and coffee to start off and keep the mood high. We experienced some initial wifi and internet access problems but luckily we had no less than two dedicated Enea IT support people present and they could swiftly fix the little hiccups that occurred. Once everyone seemed to have landed, I welcomed everyone and just gave a short overview of what to expect from the day, where the toilets are and so on. I did a rather non-technical talk about a couple of trends in the embedded operating systems market andÂ how I see the upcoming future and then some additional numbers etc. 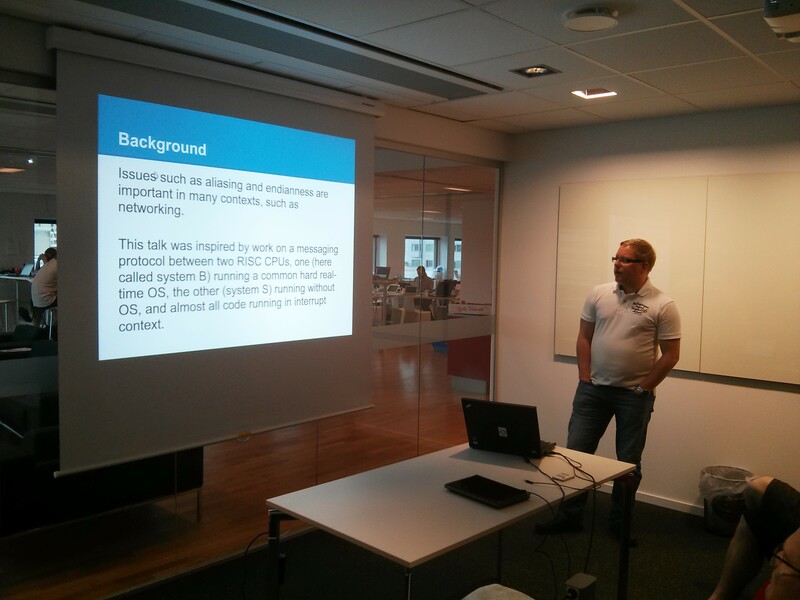 The full presentation (with most of the text in Swedish) can be found on slideshare. I got good questions and I think it turned out an interesting discussion on how things run and work these days. After my talk (which I of course did longer than planned) we served lunch. Three different sallads, bread and stuff were brought out. Several people approached me to say how theyÂ appreciatedÂ the food so I must say that Enea managed really well on that account too! Jonas Svennebring from Freescale was up next and talked about current multicore CPU development trends and what theÂ challengesÂ are for theÂ manufacturersÂ are today. 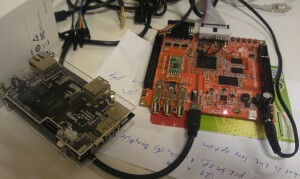 It was a very good and very technical talk and he topped it off by showing off his board with T4240 running, Freecale’s latest flagship chip that is just now about to become available for companies outside of Freescale. On this photo on the left you see the power supply in the foreground and the ATX board with a huge fan and cooler on top of the actual T4240 chip. T4240 is claimed to have a new world record in coremark performance, features 12 hyper-threaded ppc cores in up to 1.8GHz. There were some good questions to Jonas and he delivered good and well thought out answers. 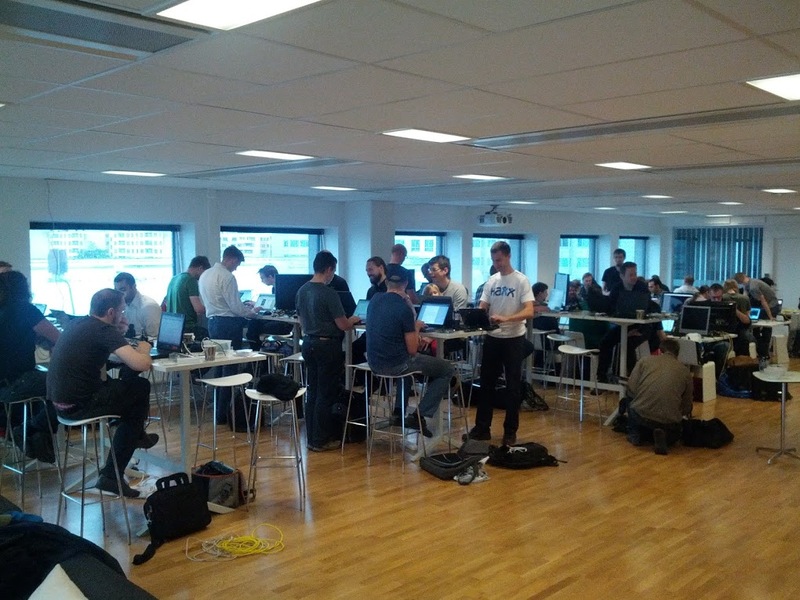 Then people walked out in the big room again to continue getting some actual hacking done. 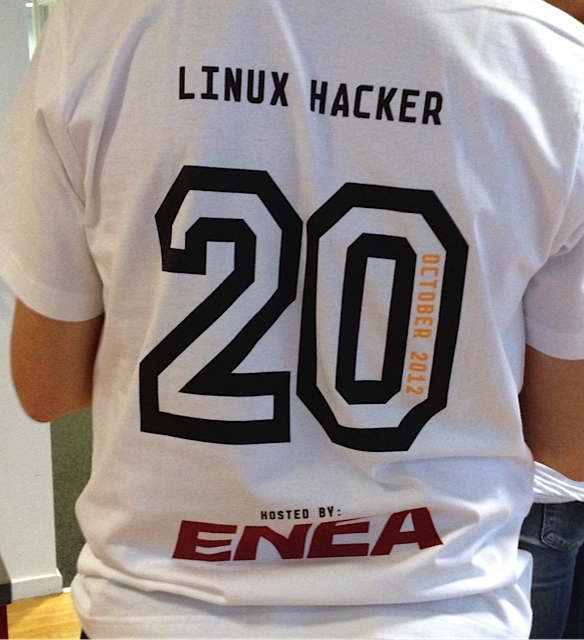 We then took theÂ opportunity to hand out the veryÂ nice-looking tshirts to all attendees, again kindly done so by Enea. The next interruption was the contest. 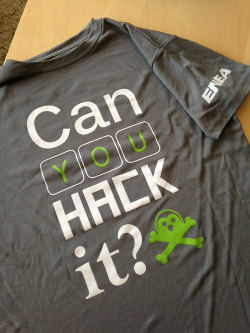 Designed entirely by me to allow everyone to participate, even my friends and Enea employees etc. On the photo on the right you can see I now wear the tshirt of the day. The contest was hard. I knew it was hard as I wanted it really make it a race that was only for the ones who really get embedded linux and have their brain laid out properly! 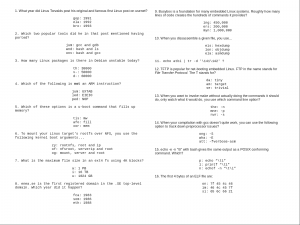 I posted the entire contest in separate blog post, but the gist of it was that I presented 16 questions with 3 answer alternatives. Each alternative had a sequence of letters. So after 16 questions you had 16 letter sequences you had to put in the right order to get a 17th question. The first one to give a correct answer to that 17th question would win. A whole bunch of people gave up immediately but there was a core group who reallyÂ foughtÂ hard, long and bravely and in the end we got a winner. The winner had paired up so the bottle of champagne went jointly to Klas and Jonas. It was a very close call as others were within seconds of figuring it out too. 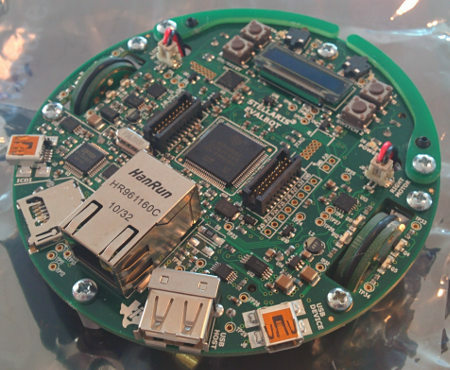 Linus from Haxx (who shouldn’t be much of a stranger to readers of this blog) then gave some insights on how he reversed engineered mp3 players for the Rockbox project. Reverse engineering is a subject that attracts many people and I believe it has some sort of magic aura around it. 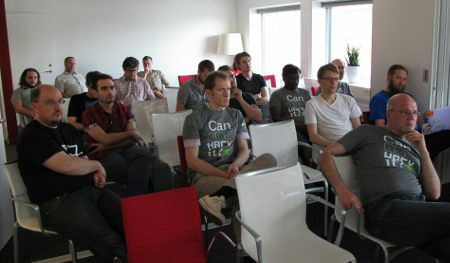 Again many good questions and interested people in the room. On the photo on the right you can see Linus’ stripped down hardware which he explained he had ripped off all components from in order to properly hunt down how things were connected on the PCB. We did not keep the time schedule so we had to get the coffee break in after Linus, and there were buns and so on. BjÃ¶rn from Haxx then educated the room on the Yocto Project. What it is, why it is, who it is and a little about how it is designed and how it works etc. 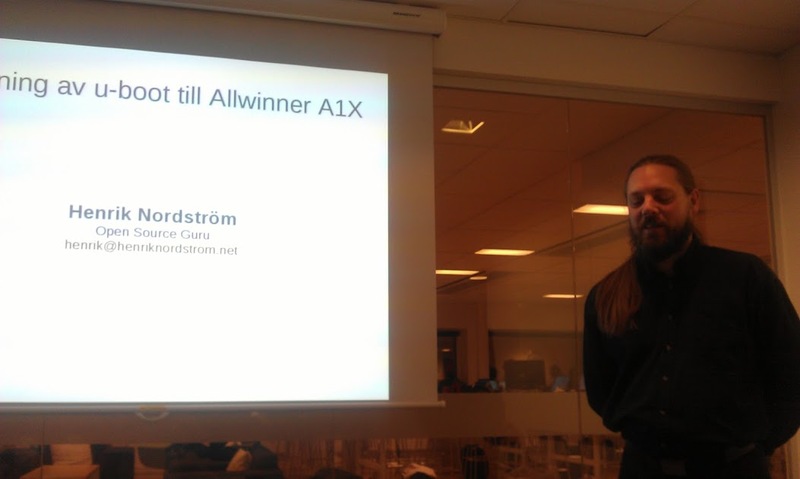 Henrik NordstrÃ¶m did a walk-through explaining some u-boot basics and then explained what he had done for the Allwinner targets and related info. I believe the talks were kind of the glue that made people stick around. Once Henrik was done and there was no more talks planned for the day, it was obvious that it was sort of the signal for people to start calling it a day even though there was still over one hour left until the official end time (20:00). I got a lot of very positive comments from people when they left the facilities with big smiles on their faces, asking for more of these sorts of events in the future. I am very happy with the overly positive response, with the massive interest from our community to come to such an event and again, Enea was an awesome sponsor for this. 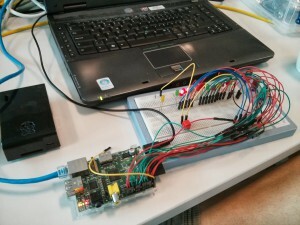 I didn’t get anything done on the raspberry pi during this day. As a matter of fact I never even got around to booting my board, but I figure that wasn’t a top priority for me this day. The crowd size felt really perfect for these facilities and 40 something also still keeps the spirit of familiarity and it doesn’t feel like a “big” event or so. Will I work on making another event similar to this again? Sure. It might not happen immediately, but I don’t see why it can’t be made again under similar circumstances. All photos on this page were taken by me, BjÃ¶rn Stenberg, Kjell Ericson, Mats Lidell and Mia Ã…kerstrÃ¶m. 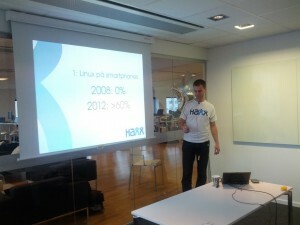 Thanks to Jonas, BjÃ¶rn, Linus and Henrik for awesome talks. 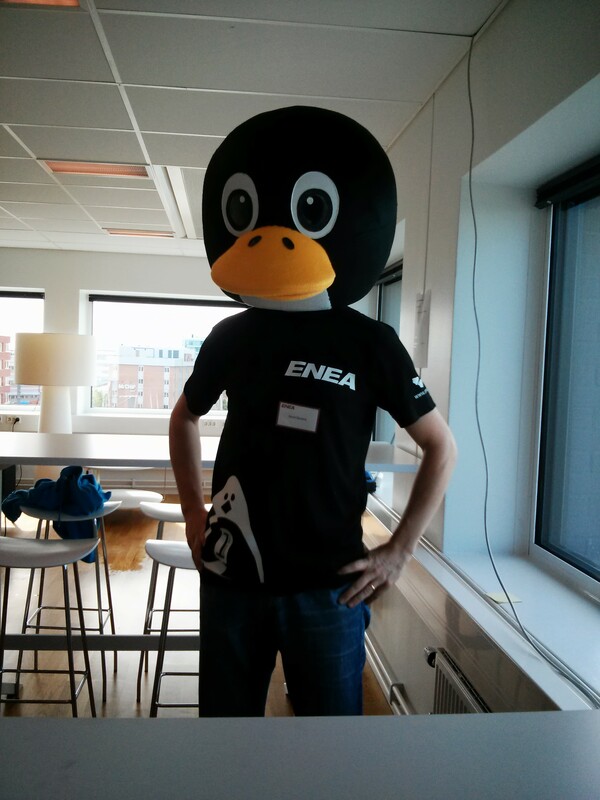 Thanks to Enea for sponsoring this event, and Mia then in particular for being a good organizer. 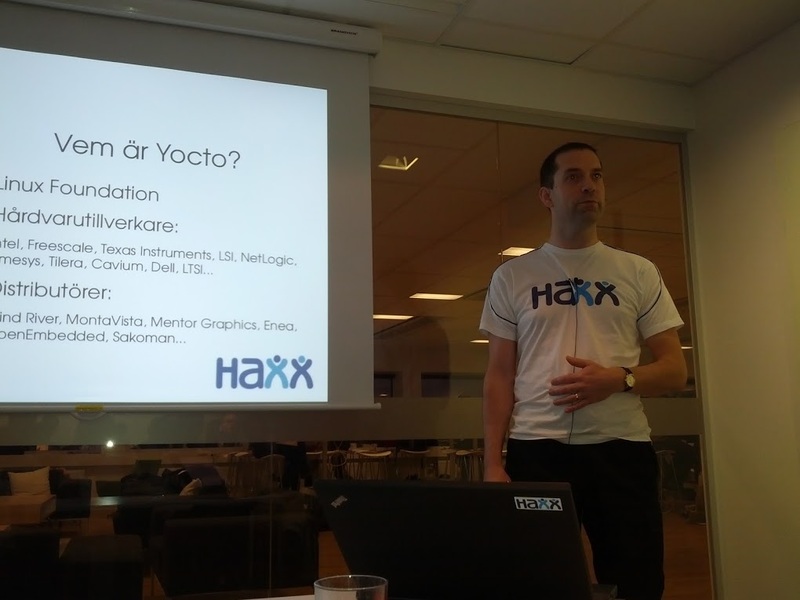 Claes at foss-magasin.se asked a bunch of questions about me, my commitments within the FOSS community and related matters recently over email. This Swedish interview just now went public: Daniel Stenberg â€“ cURL, Rockbox och FOSS-Sthlm. For my international friends who don’t understand the Swedish: I am quite happy with the questions and being allowed to answer them at this lengths etc, so I am considering doing a full translation of it and posting it at a later date. 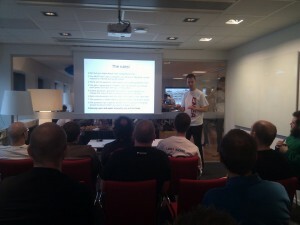 Claes, our friend from foss-sthlm and several Open Source adventures, has just fired off a new initiative: FOSS-Magasin. The site launched for real on the evening November 19th. Where there’s no real content on the site yet, Claes has set out a mission for himself and future contributors to create a site with technical content in Swedish that we geeks miss. 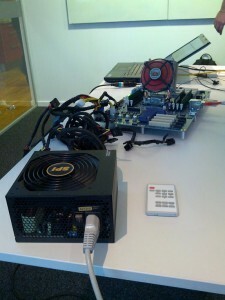 This would be within areas such as FOSS, *nix, networking and more. Tired of the poor state of technical and IT related media in Sweden that always seem to try to capture the really large audience and therefore always dumb down everything to a silly level, this is meant to be directed on more competent and interested readers. The site is free and Claes is looking around for contributors to help hem get content to publish. I can only urge my Swedish friends to join up and help it get going, as I think it would be nice to get a proper Swedish tech site. For me, it will be especially interesting for things that actually happen in or otherwise is related to Sweden, as for all the rest I personally have no problems accessing English sites to get the info. 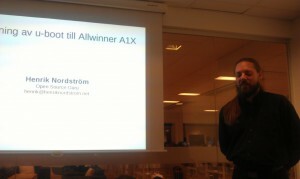 Joel Åsblom works as a “technical writer” at the Swedish “IT magazine” consortium IDG. He got assigned the job of interviewing Richard M Stallman when he was still in Stockholm after his talk at the foss-sthlm event. I had been mailing with another IDG guy (Sverker Brundin) on and off for weeks before this day to try to coordinate a time and place for this interview. 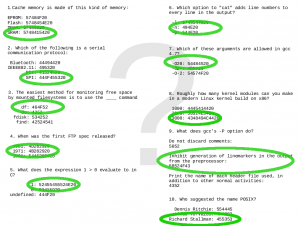 During this time, I forwarded the “usual” requests from RMS himself about how the writer should read up on the facts, the background and history behind Free Software, the GNU project and more. The recommended reading includes a lot of good info. My contact assured me that they knew this stuff and that they had interviewed mr Stallman before. 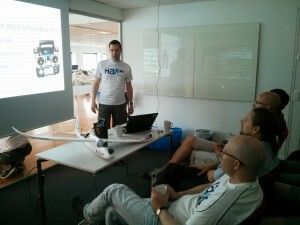 This November day after the talk done in Stockholm, Roger Sinel had volunteered to drive Richard around with his car to show him around the city and therefore he was also present in the IDG offices when Joel interviewed RMS. Roger recorded the entire interview on his phone. I’ve listened to the complete interview. 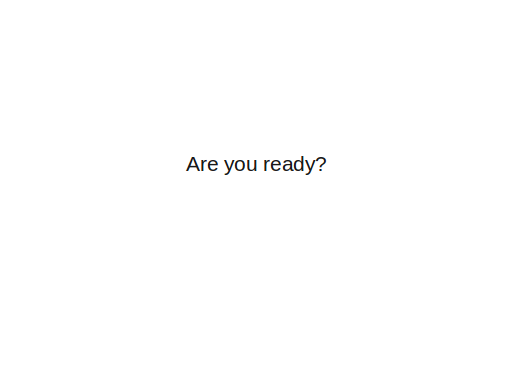 You can do it as well: Part one as mp3 and ogg, and part 2 as mp3 and ogg. Roughly an hour playback time all together. Yesterday I got an exclusive interview with legend Richard Stallman, who in the mid 80’s, published his GNU Manifesto on thoughts of a free operating system that would be compatible with Unix. Since then he has traveled the world with his insistent message that it is a crime against humanity to charge for the program. As the choleric personality he is, I got the interview once I’ve made a sacred promise to never (at least in this interview) write only Linux but also add Gnu before each reference to this operating system. He thinks that his beloved GNU (a recursive acronym for GNU is Not Unix) is the basis of Linux in 1991 and thus should be mentioned in the same breath. Another strange thing is that this man who KTH and a whole lot of other colleges have appointed an honorary doctorate has such a difficulty to understand the realities of the labor market. During the interview, I take notes on a computer running Windows, which makes him get really upset. He would certainly never condescend to work in an office where he could not run a computer that contains nothing but free software. I try to explain to him that the vast majority of office slaves depend on quite a few programs that are linked to mission-critical systems that are only available for Windows. No, Stallman insists that we must dare to stand up for our rights and not let ourselves be guided by others. Again and again he returns to the subject that software licensing is a crime against humanity and completely ignores the argument that someone who has done a great job on designing programs also should be able to live from this. The question then is whether the man is drugged. Yes, I actually asked if he (as suggested in some places) uses marijuana. This is because he has propagated for the drug to be allowed to get used in war veteran wellness programs. The answer is that he certainly think that cannabis should be legalized, but that he has stopped using the drug. He confuses freedom with price – RMS never refuses anyone the right to charge for programs. Joel belittles the importance of GNU in a modern Linux system. He calls him “choleric”. He claims you cannot earn money on Free Software (maybe he needs to talk to some of the Linux kernel hackers) and he seems to think that Windows is crucial to office workers. Software licenses a crime against humanity? From the person who has authored several very widely used software licenses? The final part about the drugs is just plain rude. During the interview, Joel mentions several times that he is using Ubuntu at home (and Stallman explains that it is one of the non-free GNU/Linux systems). It is an excellent proof that just because someone is using a Linux-based OS, they don’t have to know one iota or care the slightest about some of the values and ethics that lie behind its creation. In the end it leaves you wondering if Joel wrote this crap deliberately or just out of ignorance. It is hard to see that you actually can miss the point to this extent. It is just another proof what kind of business IDG is. Ok, so I felt betrayed and badly treated by IDG as I had helped them get this interview. I emailed Sverker and Joel with my complaints and I pointed out the range of errors and faults in this “blogpost”. I know others did too, and RMS himself of course wasn’t too thrilled with seeing yet another article with someone completely missing the point and putting words into his mouth that he never said and that he doesn’t stand for. During the weekend I discussed this at FSCONS with friends and there were a lot of head-shakes, sighs and rolling eyes. The two writers both responded to my harsh criticisms and brushed it off, claiming you can have different views on free vs gratis and so on, and both said something in the style “but wait for the real article”. Ok, so I held off this blog post until the “real article”. With opinions that it is a crime against humanity to charge for software Richard Stallman has made many enemies at home. In South America, he hasÂ more friends, some of which are presidents whom he persuaded to join the road to free source code. Joel claims RMS says you can’t charge for software. The truth is that he repeatedly and with emphasis says that free software means free as in freedom, it does not necessarily means gratis. Listen to the interview, he said this clearly this time as well. And he says so every time he does a public talk. Richard Stallman is also the founder of the Free Software Foundation, and his big show-piece is the fight against everything regarding software licenses. Joel claims he has a “fight against everything regarding software licenses”. That’s so stupid I don’t know where to begin. The article itself even has a little box next to it describing how RMS wrote the GPL license etc. RMS is behind some of the most used software licenses in the world. The fact that Joel tries to infer that Free Software is mostly a deal in South America is just a proof that this magazine (and writer) has no idea about for example the impact of Linux and GNU/Linux in just about all software areas except desktops. All this serves just as a proof and a warning: please friends, approach this behemoth known as IDG with utmost care and be sure that they will not understand what you’re talking about if you’re not into their mainstream territory. They deliberately will write crap about you, even after having been told about errors and mistakes. Out of spite or just plain stupidity, I’m not sure.